The roman-catholic church is of interest . 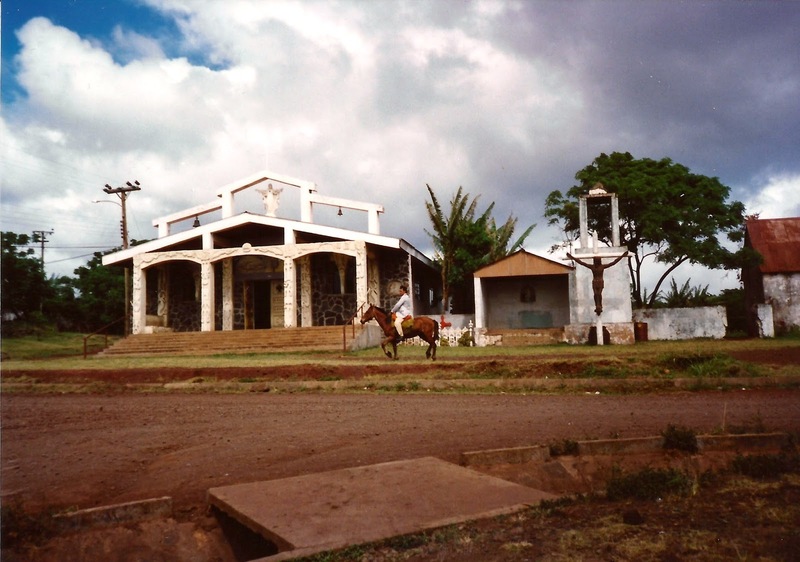 The church is located at the far end of Te Pito O Te Henua Road, if you come from the sea side. This time I didn’t have the time to walk by, but I’ll show you the older pictures. 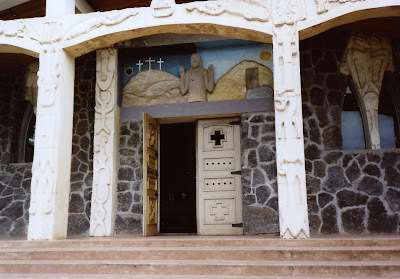 In the 20th century Father Sebastian Englert (17.11.1888 –08.01.1969),” a Capuchin Franciscan friar, Roman Catholic priest, missionary, linguist and ethnologist from Germany”, had a great influence on the catholic church of Easter Island . The Father Sebastian Englert Anthropological Museum is named after him; which I wanted to visit, but had been closed due to the presidential elections in Chile. As Father Sebastian spoke Rapanui, he translated religious songs and texts into Rapanui. He published on Rapanui, both island and language, and I wish, I could read: Englert, S. Idioma rapanui: gramática y diccionario del antiguo idioma de la Isla de Pascua. Santiago de Chile, Universidad de Chile, 1978. If you want to have a look at today’s church, please look here: . There are other churches as well, also the Mormons are active, but that’s another story. Te Pito O Te Henua Road, near the soccer field, and one near by the sea. Right now it is Easter Island meets modern medicine. Sirolimus is a macrolide compound, an "has immunosuppressant functions in humans and is especially useful in preventing the rejection of kidney transplants. It inhibits activation of T cells and B cells by reducing the production of interleukin-2 (IL-2)" . There had been an article in German with the title "Easter Island medicine allows mice to get older . You might ask now, what this has to do with Easter Island. Remember that Easter Island's original name is Rapanui. Now, Sirolimus has a second name and this is Rapamycin. The bacterium that produces Rapamycin has been found on Rapanui in 1972. Its' use to prevent the rejection of kidney transplants comes from a lower kidney toxicity when compared to calcineurin inhibitors (this toxicity and the induction of hypertension are two of the reasons why Cyclosporin A isn't much used in Rheumatology nowadays). Where's the link to my recent trip to Rapanui? I had been hiking from Hanga Roa to Rano Kao and taking the left side walk at the rim of the crater, when I suddenly saw something afar. Actually I've been asking myself in disbelief if someone had put up a honey bucket. Soon this assumption showed to be inaccurate as it is a huge slab of stone mounted on rocks, but it had been unclear for what reason because the brass plate isn't there anymore. If you want to see the brass plate, please open this link .